Action based Game delight is best offered with the Mitashi Game In Champ. 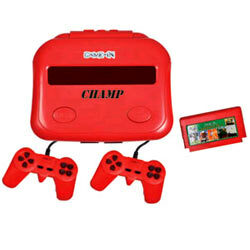 This gaming device also appears in an attractive red shade. It comes with certain gaming special enthusiastic features like supports 8 Bit Cartridges in the console, One game cartridge free, Includes 2 Joysticks, 1 Adapter and connecting cables along with Six months warranty.